It’s pretty easy to identify a pub or tavern by its atmosphere, and New Deck Tavern is no exception. Upon entering I was immediately greeted by the pervasive scent of burgers and fries from the grill, classic rock blaring from behind the bar, and the traditional cart of shelled peanuts beside the front door. For me, this was home. I’ll admit, I have somewhat of an unholy obsession with tavern food, be it either the grease-infused fries or the golden, flaky cod. It was difficult for me to remain objective during this review; however, I refrained from devouring my meal with the reckless joy of thoughtless feasting and instead suffered while thoroughly dissecting the varying levels of flavor hidden deep within each morsel. I can only hope that you find the fruits of my labor useful in your own culinary adventure. 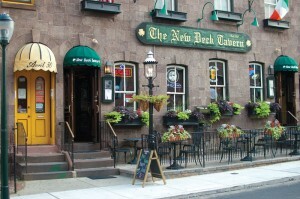 New Deck Tavern, located at 3408 Sansom Street, serves delicious meals at reasonable prices. The most expensive item on the menu is the Galway Bay Crab Cakes at $13.95. Because all three soup options were the same price, I began my meal with a choice — an unusual luxury under the restrictions of my column. Rather than the baked potato soup or the chili, I opted for the French onion soup. In all honesty, when I have the opportunity to dine on sweet onions bathed in a savory beef broth under heaps of mozzarella, there really is no “choice.” So, after tearing through the mozzarella to get to the heart of the soup underneath, I began my delicate evaluation. Overall, the soup proved quite filling for its portion size and was hearty to be sure. The beef broth had a very full consistency, and though it might have lacked a distinct flavor, I was more than satisfied. The mozzarella was a perfect complement to the broth and bread, providing a sharp flavor and the delight of trying to tear off the strings while precariously balancing the soup-filled spoon. I had only one qualm with the soup, and that was the onions. Sadly, they did not add much flavor. Now, if you’re only slightly partial to onions, have no fear — the taste is subtle but existent. Just don’t expect a huge load of oniony goodness if you order this soup. Still, despite the lacking onion flavor, the French onion soup was fantastic and, at $3.50, a solid choice of appetizer. As for main courses, New Deck offers the common tavern fare, such as burgers and battered fish, with most at prices lower than $10. The entrees will run you somewhere around the $11 range. Considering that my meal, the Galway Bay Crab Cakes, was the most expensive at $13.95, you won’t break the bank at New Deck. Truthfully, the quality of the meal more than makes up for any reservations you would have on price. Once my meal came out, I started by carefully evaluating the vegetables. The medley of carrots, cucumbers and squash in chip form turned out somewhat bland, but when dipped in the tangy remoulade sauce, they weren’t half bad. The fries, on the other hand, were exceptional, but no more so than typical tavern fries are. With a decent amount of potato in each and a slight crunch, the fries tasted great in both ketchup and the remoulade sauce. With fries and vegetables critiqued, I prepared myself for the crab cakes. Though the crab cakes delivered, I wouldn’t say they were above my expectations. The two roughly quarter-pound crab cakes had a good blend of spices inside and a nice crunch on the fried outer shell. However, the spices almost completely dominated the crab, and the inside of the crab cake was complete mush. Now, I realize that internally pureed is an accepted way to prepare crab cakes, but I am more partial to a chunked inside. As with the fries, the crab cakes tasted great in both ketchup and the remoulade sauce. Personally, I give the crab cakes an emphatic half a thumb up, but most would find the crab cakes acceptable. Everything considered, New Deck Tavern is a great place to eat with a nice, albeit typical, spread of dinner choices at very reasonable prices. The food is a bit better than average but not enough to truly set it apart from most local pubs. Still, I recommend that you give New Deck a shot and try it out for yourself.